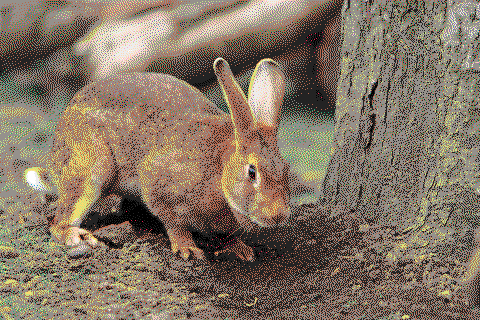 The test photo ("bunny.png") was obtained under the creative common license and is in the public domain. the path to an input image. known good image formats are .png and .jpg. the path to write the output. this will create or truncate the file at the existing location, if necessary. the image type will be inferred from the filename. currently, only .png and .jpg are supported. grayscale mode. dither to --depth bits; --depth=1 uses pure black and white, --depth=2 uses black, white, and two shades of gray, etc, etc. use RGB channels with specified bit depth. i.e, --color=color, --depth=2 uses two bits each for the red, green, and blue channels. use the crayon color palette. see "crayon.plt" for details. use the cga color palette. see the wikipedia article or "cga.plt" for details. single-color mode. dither in black and white to the specified bit depth, then replace white with the given color, using black for the background. load a palette from file. palettes are specified as a list of two or more newline-separated 24-bit hexidecimals, with optional 0x prefix. see crayon.plt and cga.plt for examples. See the documentation or Tanner Helland's article for technical details. Verbose debug output to stderr. The bit depth to compress each channel to. Should be an unsigned integer between 1 and 7 (default 1). Mutally exclusive with the --color= $FILENAME, color==cga, and --color=crayon options.